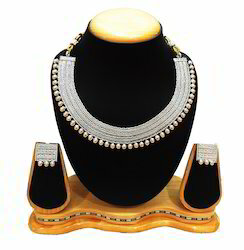 We are known for the manufacturing, exporting and supplying of the Fashion Necklace Sets. These necklaces are plated with gold either on the copper or brass material. Brand - Satyam Jewellery Nx. Wholesale rate will be different. Beautiful & Antique Gold Plated modern Style Bridal,gorgeous Earrings Set for Traditional Women Earring Set,pretty look copper base Material for Modern & Traditional Women. Gold Plated Party Wear Antique Design Chain attractive Design.pretty Look, Fashion Jewellery. 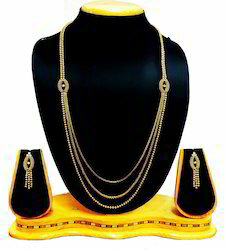 Traditional & Antique Gold Plated Necklace Set with Earing Set. 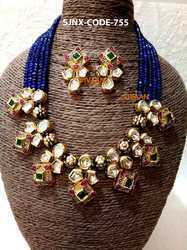 Fashion Jewellery Beautiful Look.Traditional Look. Silver Plated Design Traditional & Antique Design Neck Fit Necklace Set with Earrings Indian Jewellery. party wear necklace,Excellent finish. 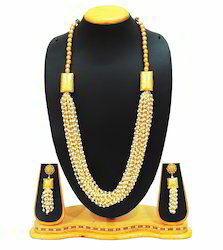 Antique Desing Gold plated & Beautiful Pearl Designer Necklace with Earring, Fashion Jewellery, Imitation Jewellery.Necklace Wear in Wedding Occasion. Wholesale rates will be different . 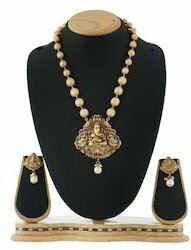 Gold Plated Mango Design Traditional & Antique Design Met Polish Neck Fit Necklace Set with Earrings Indian Jewellery. party wear necklace,Excellent finish.